Bil Baird is one of the world’s most famous living puppeteers. He was born in Grand Island, Nebraska, and educated at the State University of Iowa and the Chicago Academy of Fine Arts. His career, spanning more than fifty years, began with Tony Sarg and has brought his own puppetry into every aspect of the theatre world–night clubs, touring and trade shows, fairs and vaudeville, television and films, and Broadway musicals. In 1962 the Baird company toured India, Nepal, and Afghanistan, and, in 1963, Rusia, under the auspices of the U.S. State Department. 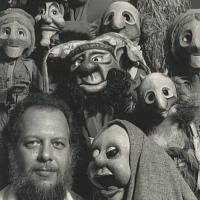 Since 1966 his activites have been centered in his 6-story puppet theatre at 59 Barrow Street in New York’s Greenwich Village. The hall, designed by Mr. Baird and Will Steven Armstrong, is long and skinny–no more than 30 feet wide. But the seats are comfortable and well spaced (lots of legroom for adults), and the floor is raked sharply enough to allow even small youngsters at the back to see well. The paint is fresh; so—thanks to a quiet conditioning system–is the air, and the bathrooms are large enough for all but the heaviest traffic. It may be the most realistic children’s theatre in New York. The Baird’s opening show is “Davy Jones Locker,” first seen here in 1959. After the intermission, there is a “pageantry of puppets”– a selection of some of the Bairds’ choicest short subjects. “Davy Jone’s Locker” has everything that a god children’s show needs–a clear story, exciting characters, chuckly dialogue, bright tunes, even a moral. In action, the puppets are magic. Despite the visible strings, the little people have a life of their own–and not necessarily the herky-jerky life of Punch and Judy, either. An underwater ballet in “Davy Jones’s Locker” looks as graceful as the real thing, seahorses languidly flipping their tails, Portuguese men ‘o war drifting to the ocean’s floor like collapsing lace curtains. 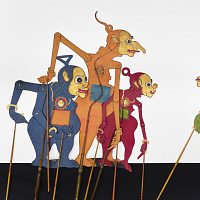 The postintermission vaudeville includes a parade of foreign puppets–from India, Bali, Italy. There is also some memorable miming to rock ‘n’ roll (the Bairds know what the kids are really listening to), and a most effective demonstration of what would happen if the trapezoids and rhomboids in the geometry book ever took it into their heads to start dancing. 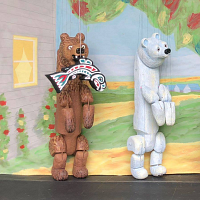 There are enough flashes in this children’s show to suggest that the Bairds’ determination to do adult programs in their new theater will be more than just an interesting experiment. 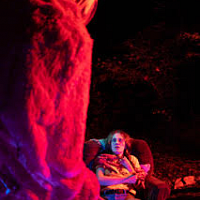 Basic purpose of theater is to continue the creation of an adult audience for live puppetry. Besides this and in the same effort we set out to attract the best playwrights, designers, composers and lyricists to the medium–feeling that their interest will up the quality all over the U.S. I don’t have to tell you why Marjorie, you know very well how we look in the world field. Our first step must be to keep the house filled and make it a popular thing for adults to attend live puppet theater. As soon as the trend seems to be set, then we will invite other companies to perform here. The only way I can see for pupetry here is to employ the best talent possible. In our rich country anybody can be a puppeteer and have a company. And more power to the principle—but when we show our face to the public we must be selective. I say that our festivals or performances where the public is concerned must be filtered–preferably by a UNIMA committee. At present we are working as though we were including home movies of the kiddies and the cat in competition with—De Sica or Ustinov. Otherwise we constantly run the risk of our pitiable showing at Bucarest. In a half hour I go downstairs to get onto the bridge. It’s a happy circumstance to live over the store. NEW YORK—The United States is the one country in the world where people think entertainment is only for children. Yet a few weeks ago part of the biggest TV audience in history watched an epochal performance by two lifelike marionettes. The occasion was the Apollo 12 moon landing on Nov. 19 and 20. When the space television transmission broke down, NBC switched to the puppets which Bil Baird and his craftsmen had designed and built months earlier at their theater and workshop in Greenwich Village. “Afterwards we were amazed to learn that many watching the telecast didn’t know the two men in space suits weren’t real,” Baird recalls. “NBC projected the work ‘simulation’ on the screen at all times, but it seems most TV watchers don’t know what it means.